We are strong believers in the automotive systems engineering approach – systems must be tested in their entirety. This is the only way to test and guarantee that the interactions between individual systems are perfectly coordinated. It is therefore extremely important to us that virtual test driving corresponds exactly with real-life test driving – and that you are able to perform detailed virtual tests of your systems within the whole vehicle in realistic traffic situations. Successful virtual test driving therefore relies on modelling the vehicle and test run as realistically as possible. Virtual and real-world test runs must follow the same rules so that tests can be easily transferred from one method to the other – only then can development effectively be made easier and more efficient. The vehicle plays a crucial role in this: The virtual prototype is of the same paramount importance for virtual test driving as the real prototype is for real-world test driving. For this reason, virtual prototypes have the same components as real vehicles. The virtual vehicle must correspond to the real vehicle in every detail and also display the same vehicle dynamics characteristics. This makes it possible to test entire systems within the whole vehicle in real-world situations from an early stage and throughout development, thereby advancing product maturity more quickly. Our clients use a range of tools for developing their vehicle systems, such as MATLAB/Simulink to develop the controller. This is why we attach great importance to providing solutions which can be integrated into our clients’ existing development processes. In order to be able to test a system as a software model or hardware system optimally in a virtual vehicle, our products offer an open integration and test platform, ensuring that clients’ pre-existing tool landscapes can be combined and expanded without issue. IPG Automotive supports you throughout all phases of the development process. Our Simulation Software enables you to perform virtual test driving and integrate your own software systems. We can also provide you with the necessary Real-time Hardware and turnkey Test Systems for implementing virtual test driving with entire systems and system networks. And don’t forget: Our Engineering Services are available to support you throughout every step of the development process. Do our vehicles satisfy the current market requirements? Have we achieved our development targets? We can help you to answer these questions precisely and reliably – even in the early conceptual phase of your vehicle. With our expertise in the area of virtual test driving, we also accompany you through all the other steps of the V-process and can find the ideal solution to current challenges. Autonomous driving, Car2X, green mobility: Putting these industry trends into practice is what drives us. However, these trends also entail an increased networking of all vehicle components, including between components in the application areas of ADAS & automated driving, powertrain and vehicle dynamics. It is essential to keep the whole picture in mind. During development, all systems must be considered and evaluated in combination with one another as early as possible. Real prototypes are not available at all stages of development – and when they are, then only in limited numbers. Our virtual prototypes present you with the opportunity to test new systems within the context of the whole vehicle at any time – from model- to software- to hardware- to vehicle-in-the-loop. 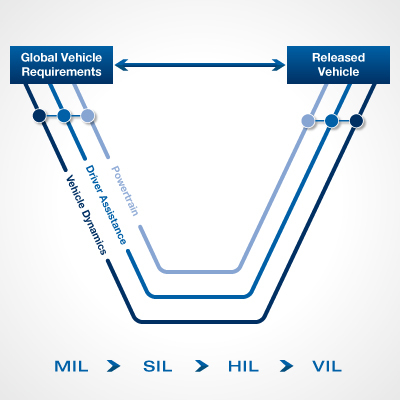 As soon as you have defined your whole vehicle requirements, models from development tools for the various domains involved can be integrated into virtual prototypes and validated (model-in-the-loop). But we also offer you appropriate testing methods at other stages further along the V-model. Whether with software (software-in-the-loop), real ECUs and entire vehicle systems (hardware-in-the-loop) or even the whole vehicle (vehicle-in-the-loop), virtual test driving enables you to test individual systems and system networks within the whole vehicle at any stage. Our simulation solutions thus facilitate end-to-end development and allow you to design cost-effective and efficient processes.